Carrot cake is a beloved classic for so many good reasons. It’s usually quite moist, lightly spiced, rich with brown sugar, dotted with plump raisins, interspersed with the crunch of nuts and contains the gentle crunch and visual allure of grated carrots. It is often slathered with cream cheese frosting, which counter-points beautifully with its slight tang. While working on Cake Balls, it was a no-brainer that I would turn this traditional cake into a cake ball. As you can see in the pic above, you can order tiny sugar carrots to nestle within the Carrot Cake Balls as an extra special finish. (Mine are from KingArthurFlour.com). 1. For the Cake: Position a rack in the middle of the oven. Preheat the oven to 350°F. Coat the inside of a 9 x 13-inch rectangular pan with nonstick cooking spray; set aside. 2. Whisk together the flour, baking powder, cinnamon, baking soda, and salt in a medium bowl to aerate and combine. Toss in the nuts and raisins until they are coated. 3. Whisk together the oil and brown sugar in a large bowl until smooth. Whisk in the eggs one at a time, allowing each one to be absorbed before continuing, then whisk in the vanilla. Fold in the carrots. Fold in the dry mixture until just combined using a large rubber spatula. Pour the batter into the prepared pan. 4. Bake for about 40 minutes, or until a toothpick inserted in the center shows a few moist crumbs when removed. Let cool completely in the pan on a wire rack. The cake is ready to use. Alternatively, double-wrap the pan in plastic wrap and store at room temperature for up to 1 day before proceeding. 5. For Assembly: Crumble the cooled cake into a large bowl. Combine the cake with 3/4 cup of the frosting. Test by compressing and tasting and add more frosting only if needed for flavor and moisture. Roll into golf ball–size cake balls. Refrigerate until firm. This can be done 1 day ahead; store in an airtight container once they are firm. 6. Line two rimmed baking sheets with parchment paper or aluminum foil. Melt the chocolate in the microwave or a double boiler. Dip the balls one at a time in the chocolate, encouraging any excess chocolate to drip back into the container. Place, evenly spaced, on the prepared pans. Sprinkle a bit of cookie crumbs, if using, on top of each cake ball while the chocolate is still wet. 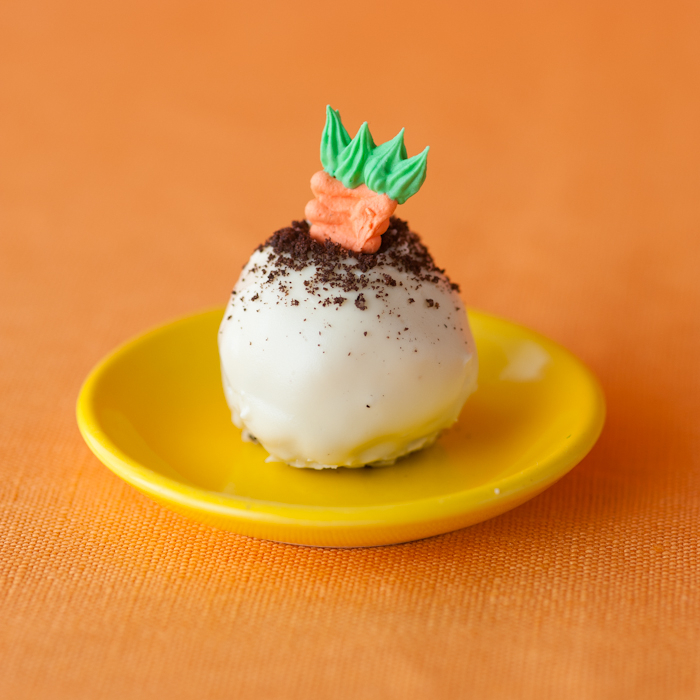 Insert a sugar carrot, if desired, into the center of the cookie crumbs by pressing the carrot down into the cake ball so that the carrot “top” is still exposed. Refrigerate briefly until the chocolate is set. Trim the bottoms, if needed. Place each cake ball in a paper cup, if desired. Place in a single layer in an airtight container and refrigerate for up to 4 days. Bring to room temperature before serving.